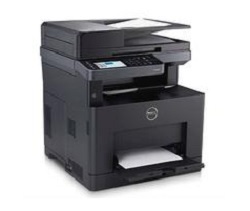 Dell S2815DN Smart Multifunction Printer intended for small offices or working groups with medium-duty printing needs. An additional key, however, is that it can work directly with SharePoint, Microsoft's enterprise-level collaboration tool for storing, organizing, and sharing data. Basic MFP features for S2815dn include the ability to print and send faxes, as well as scan to a PC, along with the ability to work as a standalone copier, fax machine and direct mail sender (which lets you scan documents and send as email attachments directly, without should send it to your PC's email client). Additionally, both can print from and scan to a USB memory key. The Dell S2815DN comes with a 250-sheet drawer, and a 100-sheet multifunctional tray, and an automatic duplexer standard. If you need more capacity, you can add an optional 550 sheet tray for up to 900 sheets. Dell S2815dn offers a flatbed letter and 50-page automatic document feeder (ADF), which can scan up to legal-size pages. The ADF can also duplex-by scanning one side of the page, reversing it, and scanning the other-for copying, scanning, and faxing. It's not as fast as scanning both sides of each page at a time but is much better than having to scan both sides manually. After duplex printing is available for scanning and printing, you can copy both single-sided and double-sided documents to a single or two-sided copy option. With a touch beyond the basics, there's built-in support for SharePoint, with which you can interact using the menu options on the 4.3-inch touch panel LCD touchscreen. Additionally, S2815dn supports mobile printing for cloud printing (assuming you connect the printer directly to an Internet-connected network), and printing from iOS, Android and Windows phones and tablets by connecting it through point access on your network The printer also supports scanning mobile through access points from iOS and Android devices only. Dell S2815DN Smart MFP Driver Download Os Compatibility: Windows 10 32 & 64-Bit, Windows 8.1 32 & 64-Bit, Windows 8 32 & 64-Bit, Windows 7 32 & 64-Bit, Windows Vista 32 & 64-Bit, Windows XP 32 & 64-Bit, Linux Rpm, Linux Debian, Mac Os X 10.13, Mac Os X 10.12, Mac Os X 10.11, Mac Os X 10.10, Mac Os X 10.9, Mac Os X 10.8, Mac Os X 10.7, Mac Os X 10.6, Mac Os X 10.5.